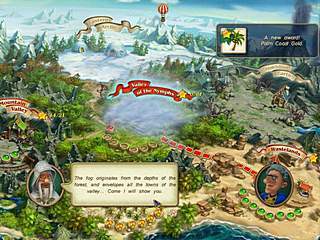 Royal Envoy 2 is the sequel to one of the best strategy games of the last year. The game has something in common with all of the games of this genre, something familiar from the previous release, and something unique to this release. If you are a fan of this genre, you might not be able to get as many new releases as the fans of the hidden object game genre, but you are kind of lucky this time. You are going to save the kingdom of Middleshire from many problems by managing the resources available to you. If you played the first game, you might be happy to see Cedric. If not, I'm sure you won't be disapponted either. If you are a fan of this genre, you might not be able to get as many new releases as the fans of the hidden object game genre, but you are kind of lucky this time. And the reason is because I don't think I have ever played a hidden object game that would last at least like 10-15 hours. You will have to go through all 63 levels. Then there are also bonus challenges for you. Those are available after completing the regular game. Each level is rated with 1 to 3 stars. So if you are more of a perfectionist, you might want to go back or not leave until you finish them with 3 stars. That means you will spend even more time with this game. 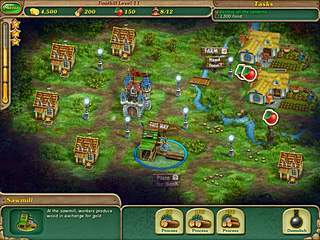 You will have to complete very familiar tasks in this game, like building houses, training workers, increasing happiness of the citizens, or producing materials. This second game encreases the challenge level of the game, which is even better if you don't want to leave the game too soon. The game features absolutely beautiful landscapes of all the villages you are to improve. Please teach the rest of these internet hooligans how to write and reesrcah! so i have downloaded the game, currently am in level 36, but i believe that is the end of the game! i'm so frustrated, i tried replaying the same level over 10 times and here is the problem why: the game starts with 400 wood, zero money and zero food! following by breaking wood to continue path and after breaking the chest gives only $5000 which we can only build either a sawmill or a market but no houses because there arent any wells! and we cannot process the game without making the leprechaun happy which he wants 400 happiness and we can only make 100-150 happiness from what we have and nothing else works! How do we complete that level? This is Royal Envoy 2 review. Download this game here.